Is It Good? Star Trek/Green Lantern: The Spectrum War #1 Review – AiPT! Crossovers can be dicey affairs, mostly because they so often end up being cash grabs and nothing much more. 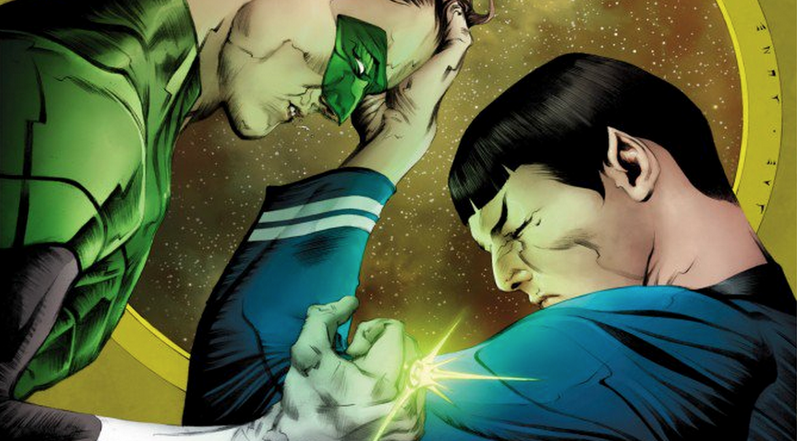 I’ve been wary of crossovers because of this and yet a Star Trek meets Green Lantern crossover seems so damn right. Considering the Star Trek crew has encountered so many wild alien technologies it isn’t such a stretch to believe they could meet. I give this new series a chance to answer the question, is it good? First and foremost this is a well written and well paced comic. Starting from there you can only go up really, because those are the most important factors in making a comic readable. Fans of the recent Star Trek movie series reboot should also love this comic (yes I used the word love), as their voices and characters are strong. To add to this the comic has a nice hook, an ominous villain and makes some sort of logical sense too. This issue opens on the planet Mogo aka the “last” Green Lantern, where Ganthet is being chased by a variety of lantern rings of different colors. A voice speaks with black captions in white text which insinuates the villain after him is a big baddie. In order to escape, Mogo transports himself to “another time” and “another universe” and from there we’re introduced to the Star Trek crew. They come upon a rogue planet and go down to investigate only to find Mogo’s skelton and the lantern rings of different colored variety. Writer Mike Johnson may spend most of this issue setting up the series, getting the characters to become familiar with what sort of power they just came across and distinguishing the characters from one another. These are all very important aspects, especially for those who aren’t familiar with the Star Trek characters. Kirk, Spock, Bones and all the rest all get moments in this issue to speak and do their thing. It’s quite a nice outline of events as nothing drags and everyone gets a moment. There’s no telling when this issue takes place in the Star Trek timeline but I assume after Into Darkness. That means we have a tight knit team ready for exploration. Green Lantern fans should be happy with this issue as far as its introduction with Mogo and ultimately the cliffhanger ending. I don’t want to spoil it here, but the idea makes a lot of sense and could mean some compelling dynamics as characters react to Green Lantern with some newfound abilities. Art by Angel Hernandez looks great with some well thought out layouts to keep the story flowing nicely. Hernandez simply nails the faces of the actors from the film. There isn’t a panel that looks odd or inaccurate. At one point, one of the best scenes in this issue, the rings get powered up and sent around the ship and Hernandez really sells the power and awe that these rings can deliver. One full page spread has Scotty and his alien buddy jumping back and the flash and explosion of the rings looks stupendous. And hell, who doesn’t want to see the Enterprise cast in a green glow as it’s being protected by Green Lantern? So his story didn’t end well did it? This is a well written and entertaining issue that has proven there is no cash grab going on here. Instead we’re being delivered an exciting crossover that makes sense, captures the wonder of both properties and does a fantastic job with its characters.